In this well-rounded, deeply-investigated biography, the first full look at the vice president, two award-winning journalists unmask the real Mike Pence. Little-known outside his home state until Donald Trump made him his running mate, Mike Pence—who proclaims himself a Christian first, a conservative second, and a Republican third—has long worn a carefully-constructed mask of Midwestern nice. Behind his self-proclaimed humility and self-abasing deference, however, hides a man whose own presidential ambitions have blazed since high school. Pence’s drive for power, perhaps inspired by his belief that God might have big plans for him, explains why he shocked his allies by lending Christian credibility to a scandal-plagued candidate like Trump. 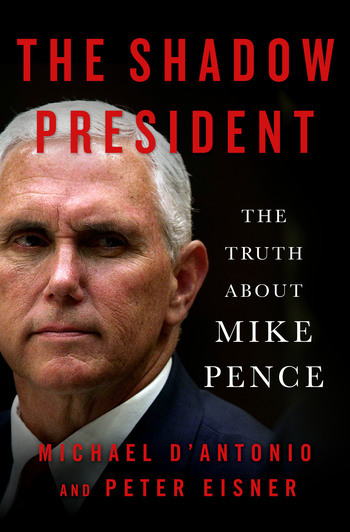 In this landmark biography, Pulitzer Prize-winner Michael D’Antonio and Emmy-nominated journalist Peter Eisner follow the path Pence followed from Catholic Democrat to conservative evangelical Republican. They reveal how he used his time as rightwing radio star to build connections with powerful donors; how he was a lackluster lawmaker in Congress but a prodigious fundraiser from the GOP’s billionaire benefactors; and how, once he locked in his views on the issues—anti-gay, pro-gun, anti-abortion, pro big-business—he became laser-focused on his own pursuit of power. As THE SHADOW PRESIDENT reveals, Mike Pence is the most important and powerful Christian Right politician America has ever seen. Driven as much by theology as personal ambition, Pence is now positioned to seize the big prize—the presidency—and use it to fashion a nation more pleasing to his god and corporate sponsors. Michael D’Antonio is the author of numerous books, including the acclaimed The Truth About Trump, which The New York Times Book Review praised as an “admirably straight­forward, evenhanded but nonetheless damning account of Trump’s life.” He is a writer and on-air CNN contributor who specializes in national politics and currently writes for CNN.com, the Boston Globe, and the Los Angeles Times. His books have been noted as “best of the year” or “editors' picks” by The New York Times, the Chicago Tribune, Businessweek and others. Prior to becoming a full time writer he was a reporter for Newsday, where he was a member of a Pulitzer Prize winning team and covered politics, religion. His feature articles have been published by Esquire, The New York Times Magazine, Sports Illustrated, and Discover among others. He lives in New York. Peter Eisner has won national and international awards for his writing and investigative reporting as a foreign correspondent, editor and reporter atThe Washington Post, Newsday, and the Associated Press. His 2004 book The Freedom Line, which won the Christopher Award, is the story of young resistance workers who rescued Allied fighter pilots during World War II. Eisner was nominated for an Emmy in 2010 as a producer at PBS World Focus. He is based in Washington, D.C.